A fresh new look for your home doesn’t require expensive contractors and interior design consultants. If you have a modest budget and the time and motivation to put in a bit of hard work, there are plenty of small “do it yourself” projects that can make a dramatic difference in he appearance of your home. From the interior to the exterior, this article will give you some realistic ideas for home improvement. All that’s left is to roll up your sleeves and get to work beautifying your home. Crown molding is an elegant wood trim that is applied everywhere the wall meets the ceiling. This easy-to-do project adds a touch of class to the home by taking away the abrupt right angles that make a room looks boxy and confined. There are many different styles and sizes of crown molding, so be sure to select the style and color that best suits your home. Easy preparation and installation instructions can be found here. Old bathroom tile can begin to look cracked and faded after many years of use. A new tile design can help restore shine and give your bathroom a brand new, modernized feel at a reasonable cost. Before you begin this project, bring sample slabs of marble and tile back to your bathroom to gauge how they will look. Just like with painting, designs that look great in a store might look much different in the context of your home. Next, decide whether you will tile the floor only, or if you also plan to tile the walls to match the new floor. Measure the square footage of the room and study different combinations of marble and tile mosaic patterns before you buy. Once you have your measurements down and vision in mind, follow this step by step guide to successfully installing your new tile bathroom. Even if your house is big and beautiful on the outside, a boring yard that lacks color and personality can make the home look much less attractive. An easy remedy to this problem is to install a garden that surrounds the front and rear of the home. The fun part about building a garden is that there is no “standard” way to go about it. Plant selection, stone edging, bedding type, size and length are all up to your own personal preferences. So long as you try to contrast the colors of the flowers with the color of your home (white flowers look great against dark colored homes, for example) the rest of the customization is all about taste. Some helpful tips on putting together your first garden can be found here. New paint (especially brighter paint) can liven up a room like nothing else. Dark paints trap light in the corners of a room and make the space feel smaller than it actually is, and old faded paint can make a home look dingy and poorly kept. Applying a fresh color to the interior of a home can create a rejuvenating feeling and make every room look like new again. Don’t forget the exterior of your home, either. If you have pained wood siding, you should aim to repaint the outside of the home every 6 to 10 years depending on climate conditions. Whether you stick with the same color or switch to a new one, fresh paint will restore luster to your home and get rid of faded, cracked and peeling paint that can make your home look neglected. If you really want to spruce up the look and feel of your kitchen, perhaps it’s time to replace those old, painted cabinets that came with the house when you bought it. New glass and wood cabinet fixtures can transform a kitchen from average to elegance almost entirely on their own. Couple the job with some new marble counter tops and suddenly you wont even recognize your new kitchen from the old one. Best of all, installing new cabinets is one of the easier DIY home improvement jobs that you can take up. For a complete guide to a beautiful new kitchen cabinet arrangement, check out this informative video walk-through. Indoor lighting is sometimes overlooked as an unimportant aspect of a room to improve. The standard lamp in the corner and lightbulb in the ceiling gets the job done just fine, but those who want to go beyond a mere “lights on-lights off” look should consider upgrading to mood lighting. Often, the style of lighting you install sets the entire emotion that the home gives off. Dimmers are a good place to start, as sometimes you want low-light conditions for a romantic dinner or quiet night in. Bright florescent lights bring out the a rooms flaws and can be hard on the eyes. Instead of these, colored glass lighting fixtures can be installed to a room’s ceiling to cast a softer light and create a more relaxed tone. For those who have a great looking garden outside of their home (or if you plan to build one as suggested earlier in this article), landscape lighting can bring out the beauty of your home and yard when the sun goes down. There are many types of landscape lighting fixtures that are used for different effects. Some shine against the walls of your home from the ground up while others illuminate flower beds and landscape ponds. The right outdoor lighting depends on your yard and desired look. To get ideas for your landscape lighting job and read about installation procedures, check out the products and resources at Landscape Lighting World. Old chipped doors can detract from the beauty of a home’s interior. One solution is to repaint the doors, but often home owners don’t realize the charming effects of installing elegant new doors. Interior doors don’t need to be boring rectangles of flat wood with doorknobs. In fact, new doors come in endless designs including bevels, engravings, windows, stains and finishes that add an extra touch of elegance to the inside your home. Combine new doors with matching doorway molding for added effect. 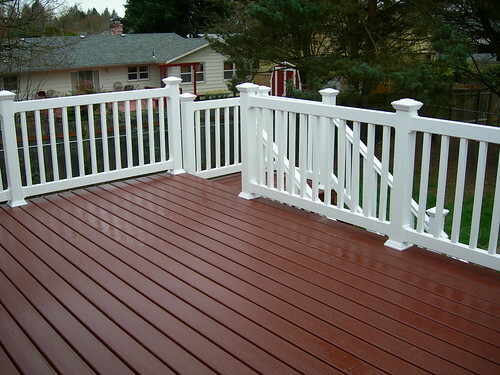 For those looking to roll up their sleeves and take on a big DIY job, nothing adds value to a home like a brand new deck. So long as you’ve got sufficient yard space, a deck will provide you with a great place to host guests, hold barbecues, or just relax on sunny day with a good book. While a new deck is certainly a more difficult job than most, it is still completely doable if you have the time to dedicate to the improvement of your home. For a complete set of instructions on supplies, planning, building and installing your new deck, consult the free materials at Decks.com. About the Author: Chris Bennett is a marketing director for Vacuum Home. Vacuum Home has quickly become a premier online retailer of residential and industrial vacuum cleaners. Since our inception, our key objective has been to provide high-quality, competitively-priced vacuums such as Hoover vacuums, that will serve to meet the high demands of our customer base.